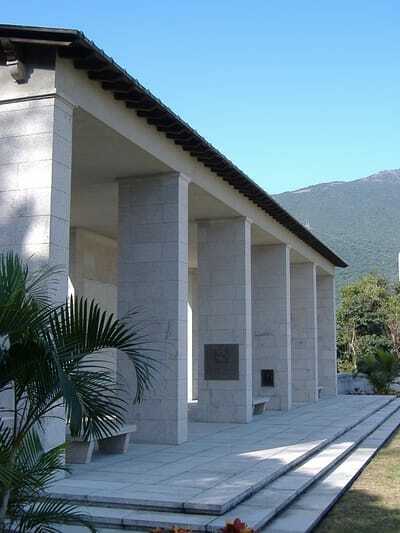 Sai Wan Memorial is situated in Sai Wan War Cemetery which is located on Cape Collinson Road situated in the north-east of the island of Hong Kong, about 11 kilometres from the centre of Victoria. The cemetery is located on Cape Collinson Road, Chai Wan, Hong Kong Island. Take bus route No. 9 to Shek O from Shau Kei Wan bus terminal, adjacent to exit A3 of mass transit railway Shau Kei Wan station and alight at Cape Collinson bus stop beyond the roundabout on Shek O Road. Walk downwards along Cape Collinson for approximately 600 metres. To travel to Sai Wan Cemetery from Stanley Military Cemetery take bus No. 14 to Grande Promenade outside the cemetery on Wong Ma Kok Road and alight at Shek O Road bus stop in front of the roundabout on the Tai Tam Road. Walk south into Shek O Road then turn left and walk downwards along Cape Collinson Road for approximately 600 metres. The Cape Collinson area has many cemeteries. Walking up this narrow one-way traffic road, one will pass the Catholic Cemetery situated on the hillside to the left of the road, and the Hong Kong Military Cemetery on the right. Sai Wan War Cemetery is about half way up Cape Collinson Road and faces the Muslim and Buddhist cemeteries. Sai Wan Memorial is located within Sai Wan War Cemetery. The cemetery is open daily; 08:00 - 17:00. 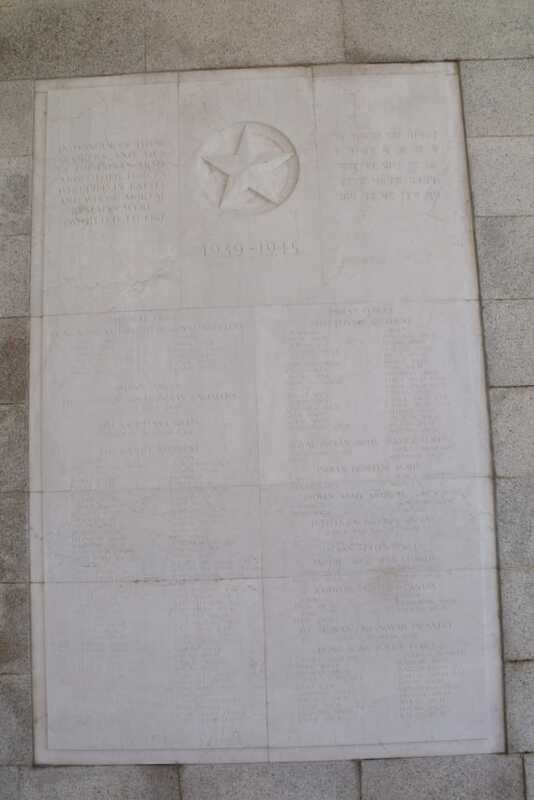 The SAI WAN MEMORIAL forms the entrance to Sai Wan War Cemetery and bears the names of more than 2,000 Commonwealth servicemen who died in the Battle of Hong Kong, or subsequently in captivity, who have no known grave. 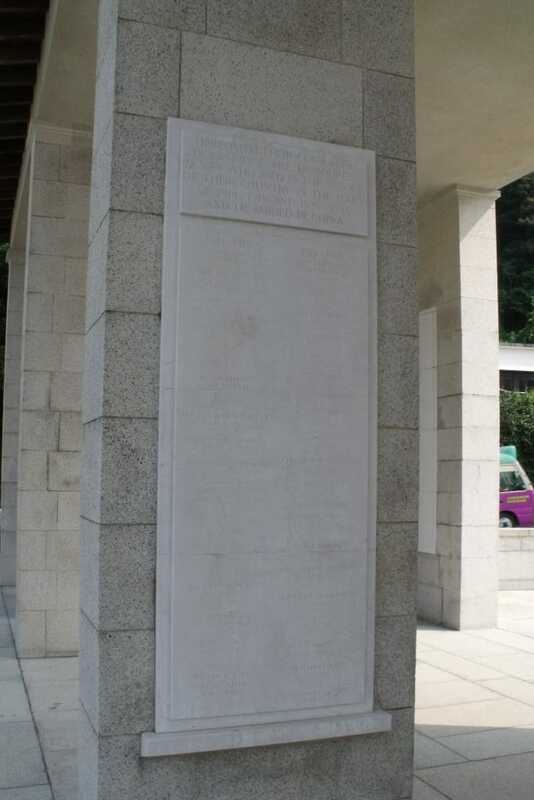 Additional panels to the memorial form the SAI WAN CREMATION MEMORIAL, listing the names of 144 Second World War casualties whose remains were cremated in accordance with their faith, and the SAI WAN (CHINA) MEMORIAL, commemorating 72 casualties of both wars whose graves in mainland China could not be maintained. 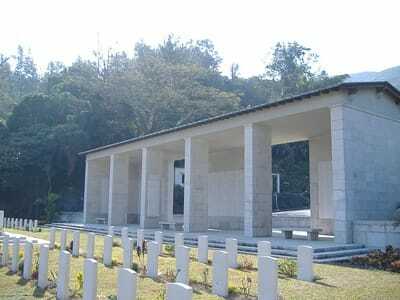 SAI WAN WAR CEMETERY contains the graves of more than 1,500 Commonwealth servicemen who died during the Second World War, more than 400 of them unidentified. A small number of First World War casualties are also commemorated in the cemetery. Both the cemetery and memorial were designed by Colin St Clair Oakes. The memorial was unveiled by Sir Alexander Grantham, the Governor of Hong Kong, on the 20th February 1955. H/6008 Warrant Officer Class II John Robert Osborn, V. C.
Winnipeg Grenadiers, R. C. I. C., died 19th December 1941, aged 42. Panel 25. Son of John Robert and Harriet Sussana Osborn; husband of Margaret Elizabeth Osborn, of St. Vital, Manitoba, Canada. Citation: The citation in the London Gazette of 1st April, 1946, gives the following particulars : At Hong Kong, on 19th December, 1941, a company of the Winnipeg Grenadiers became divided in an attack on Mount Butler. A part of the company led by C.S.M. Osborn captured the hill at bayonet point, but after three hours owing to the superior numbers of the enemy the position became untenable. C.S.M. Osborn and a small group covered the withdrawal and when their turn came to fall back he single-handed engaged the enemy, exposing himself to heavy enemy fire to cover their retirement. Later the Company was cut off and completely surrounded. Several enemy grenades were thrown which C.S.M. Osborn picked up and threw back. When one landed in a position where it was impossible to pick it up, he threw himself upon it and was instantly killed. His self-sacrifice undoubtedly saved the lives of many of his comrades. C.S.M. 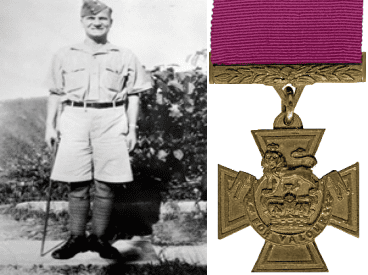 Osborn was an inspiring example to all throughout the defence, and in his death he displayed the highest qualities of heroism and self-sacrifice.